This 15-minute recipe is about as simple as you can get. 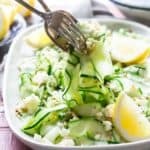 It is just a simple no-cook zucchini ribbon salad made with a vegetable peeler and a few basic ingredients including zucchini, hazelnuts and feta cheese! Add a sprinkle of salt, olive oil and lemon and you’re good to go! This summer I have my own little CSA going. No I am not a member, I mean I’m the farmer. Well, sort of. I’m kinda pulling your chain. I just wanted to say that because it makes me feel cool. What the real story is, I have a garden, and am not able to be at home (we’re at the lake) enough to deal with it. So I struck a deal with my friend Abby. She was going to be my one member CSA. The only payment I am taking from her, is if she can stop by occasionally to water. A handy thing while we were on our road trip. And she and her kids would help me stay on top of harvesting (and eating) the green beans, cucumbers and zucchini. What is the deal with zucchini seeds coming in packages of like 120 seeds. Why would anyone ever need 120 zucchini seeds? Unless they were an actual farmer. You know how many zucchini seeds you need? 1. One seed is plenty. Seed companies, listen up: They should just come in 1 packs. Maybe 2 just in case. I know this. By now, I have come to the realization that when planting zucchini, you only need one plant. Because one plant is PLENTY to keep up with. Do I learn? Nope. I prep the bed, and I open the package and then I see all those seeds and then there is a funny short circuit that happens and I go a little crazy. And I plant and plant and then… I end up needing my own little CSA. That’s why I have Abby. 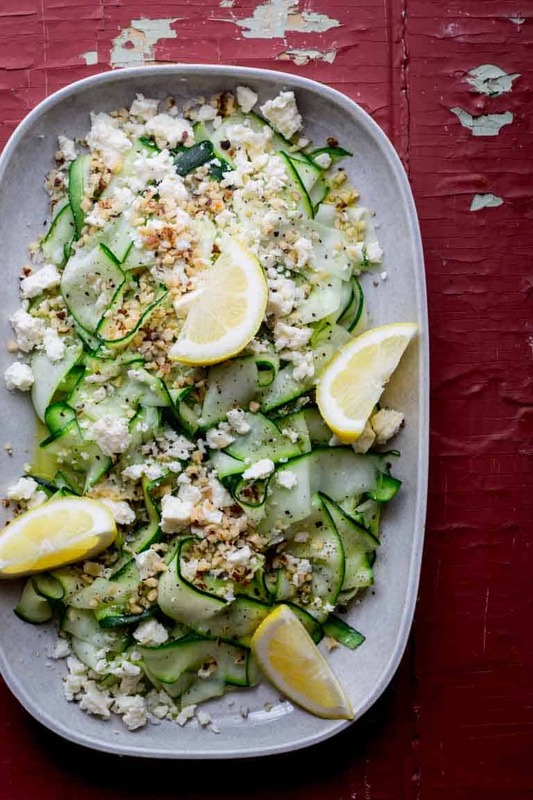 Dear readers, do you too have a ton of zucchini to use up? Then you are in the right place my people! I have a recipe for us to enjoy! It takes 15 minutes to prep (if even that.) And it is so fresh and lovely. 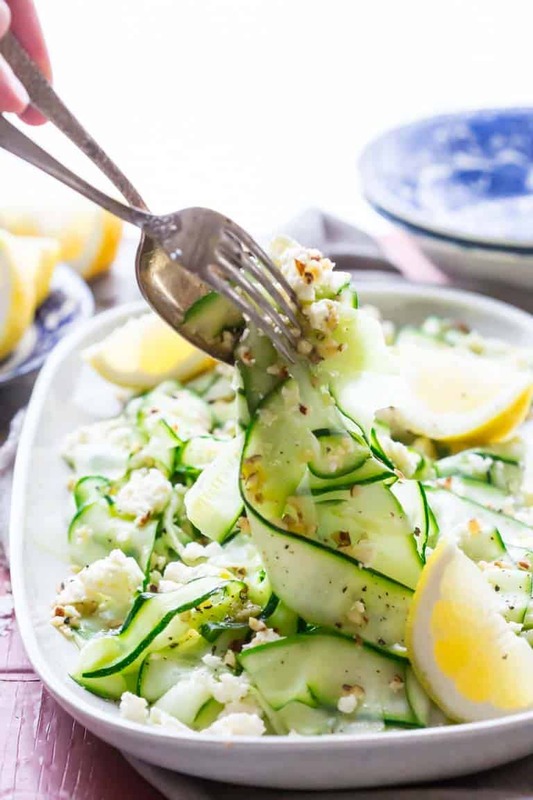 This Raw Zucchini Ribbon Salad with Hazelnuts and Feta is fresh and lovely summer vegetarian salad that will use up a ton of zucchini from your garden and it’s ready in just 15 minutes! Peel zucchini into long ribbons with a vegetable peeler, stopping at the soft seedy core. Place ribbons in a large colander. Sprinkle with ½ teaspoon Maldon Celtic sea salt and toss to combine. Let sit 10 minutes. Blot and toss by hand with several clean dry paper towels to absorb moisture, without crushing the zucchini ribbons. Arrange ribbons on large platter. Sprinkle with the remaining ½ teaspoon salt. Drizzle with oil. Top with feta, nuts and pepper. Serve with lemon wedges. ahhh this looks so good! I’ve been eating a salad like this! I’ll have to try it with the hazelnuts! I Love hazelnuts, but always forget to use them in savory dishes. I really love the way they taste in this. Hope you like it too Rebecca. This sounds like a perfect summer recipe because it would be nice and light! 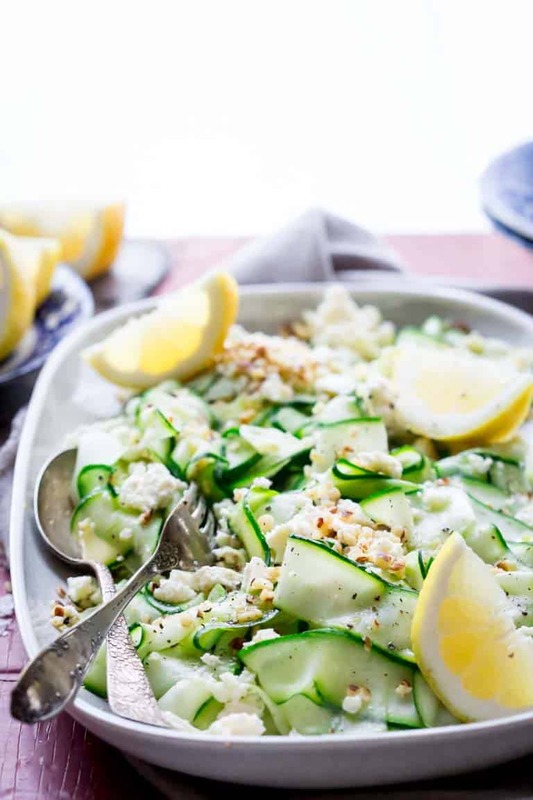 Plus I love anything with feta! Yum! The zucchinis are coming in strong, so good thing we love this with our meal so much too! I feel like I should be thanking Abby too! Now we all have a beautiful recipe for zucchini! OMG, she would crack up to hear that! Thanks for coming by Tina! You are so very welcome! And thank you! 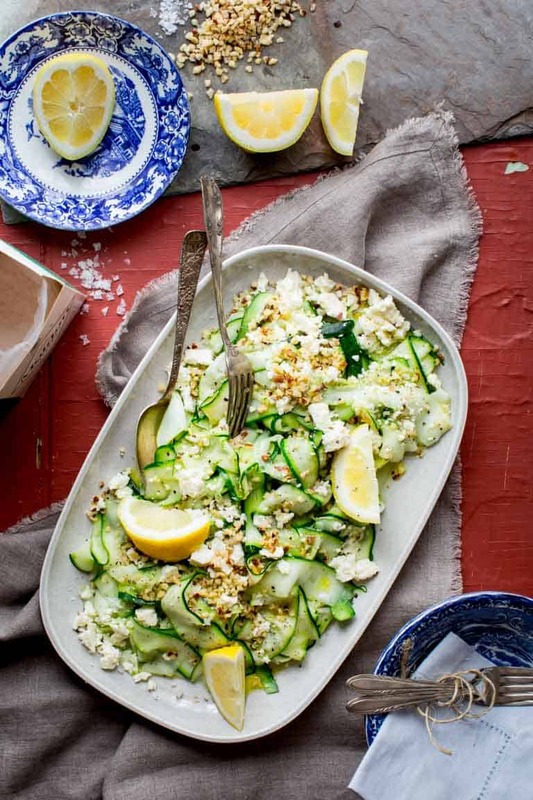 This sounds so good – I love the idea of adding feta and hazelnuts – and your pictures are absolutely gorgeous. Those pops of green! That bright yellow citrus! 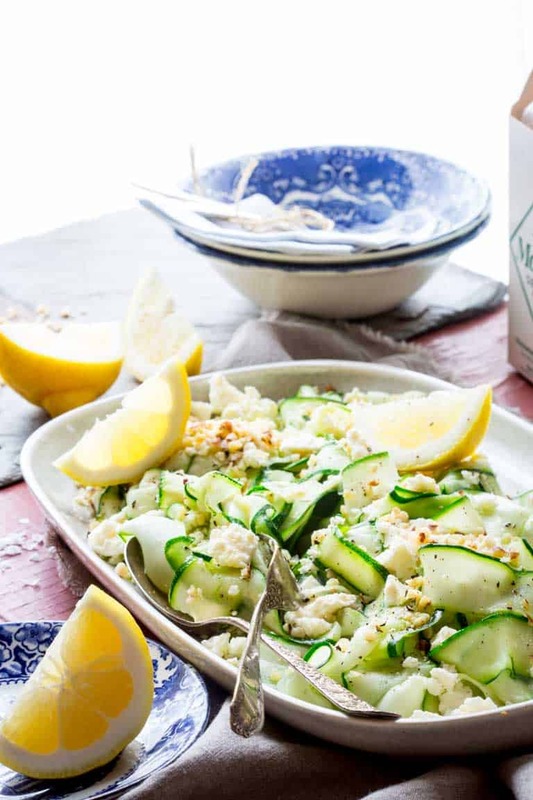 🙂 The recipe is, of course, perfectly timed for everyone’s overabundance of zucchini, too. I can’t wait to try it once I have a bunch myself! I just picked two more this morning. I better let Abby know she has to come tomorrow! They grow so fast! Lol! What a nice way to eat zucchini. The thin strips are so inviting in this salad!